Query: To conduct gene list enrichment analysis on obesity-associated genes. 2. 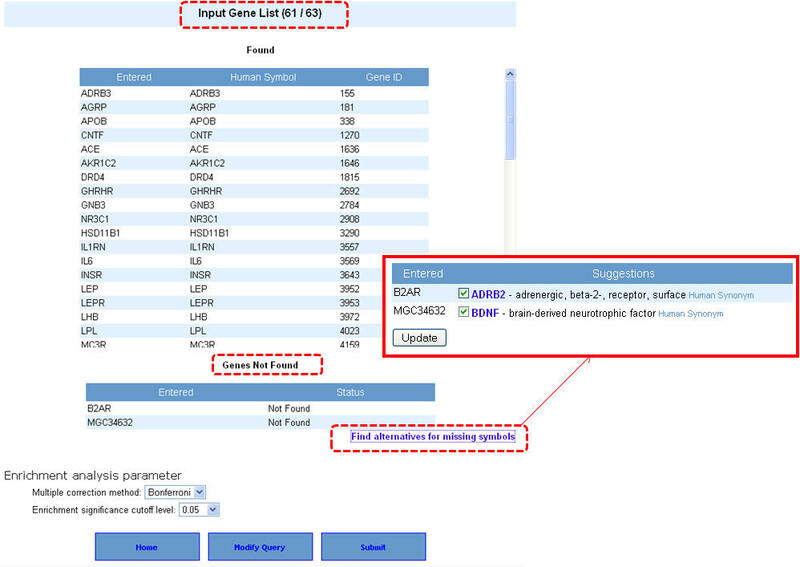 On the "Gene list enrichment analysis" enter either human gene symbols or human NCBI Entrez Gene IDs in the box against "Training Gene Set" and click on "Submit Query". 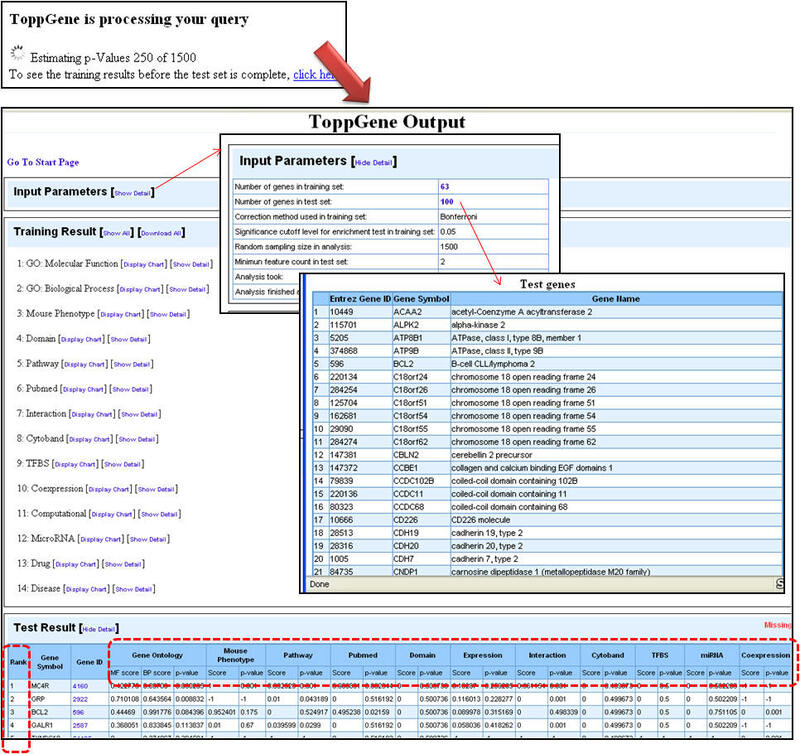 ToppGene supports RefSeq and UniProt IDs too. For the list of obesity genes, see the Supplementary File 2. 3. You can select the appropriate statistical parameters under the "Enrichment analysis parameter" and then hit "Submit" button. The default parameters are "Bonferroni" for multiple correction method and 0.05 for significance cut-off level. 4. If your gene list contains non-approved symbols or duplicates at this stage, they will be listed under "Genes Not found". You can then resolve this by selecting the appropriate symbols from a list of suggestions (see 4 below). 4. If your input gene list contains synonyms or alternate symbols other than approved human gene symbols, you will be prompted to select from a list of alternatives. Once you select the approved symbols, click on the "update" button to allow these genes also to be added back to your input list. This will take back you to the previous screen, wherein after selecting the enrichment analysis parameters you can proceed with the analysis by clicking on "submit" button. Query: To rank or prioritize a list of genes (test set) by functional annotation similarity to training set. Here, we will use a list of known obesity associated genes compiled from NCBI's OMIM and Entrez Gene as the training set. The test set is built by creating an artificial linkage interval using a GWAS identified/confirmed obesity genes. In this case, we have used MC4R gene as the candidate gene. The test set is generated by adding 99 nearest neighboring genes of MC4R on the chromosome (99+1=100 test set genes) (see Supplementary File 2 for the lists of training and test set genes) . 2. 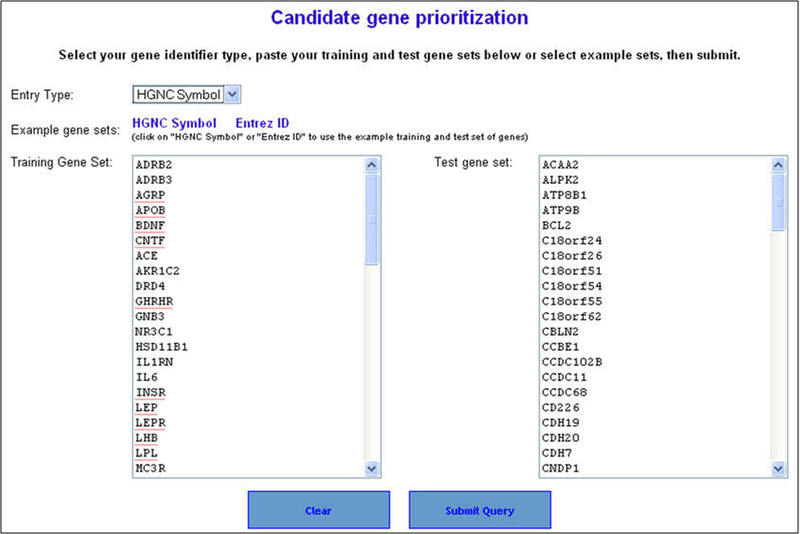 On the following page ("Candidate gene prioritization"), enter either gene symbols or Entrez gene IDs, and click "submit query". 3. Select the appropriate statistical parameters. The "random sampling size" option is for selecting the background gene set from the genome for computing the p-value while the "Min. feature count" represents the number of features that need to be considered for prioritization. The default options are 6% of the genome (or 1500 genes from a total of 25000 genes) for random sampling size and feature count is 2. As described earlier in the enrichment analysis, if your gene lists contain alternate symbols or duplicates they are ignored or presented with the option to resolve them and add them back to your input list. Additionally, if there are common genes between training and test sets (i.e. test set genes which are also found in training set), these will be removed from the test set and no ranks will be assigned to them. After selecting the appropriate statistical parameters (training and test) click on the "start prioritization" button. 4. Once the analysis is complete, the first half of the results page is similar to what you have seen under enrichment analysis results except that the input parameters show the test set genes also. The prioritized list of test genes sorted according to their ranks based on the p-values are displayed in the lower half. Each column indicates the features used to compute similarity between training and test set. Query: To rank or prioritize a list of genes (test set) based on topological features in PPIN. We will again use the same list of known obesity associated genes compiled from NCBI's OMIM and Entrez Gene as the training set. The test set, as described earlier, is built by creating an artificial linkage interval using a GWAS identified/confirmed obesity genes. In this case, we have used MC4R gene as the candidate gene. 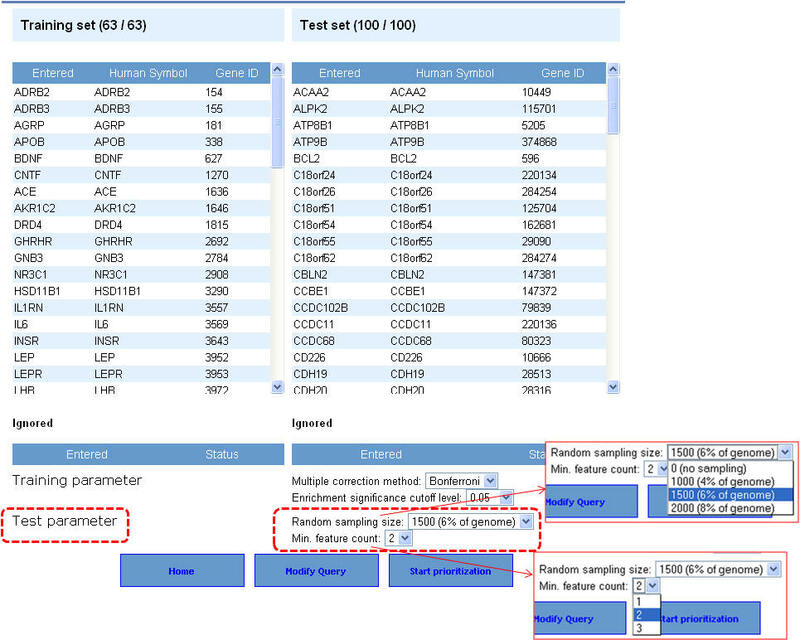 The test set is generated by adding 99 nearest neighboring genes of MC4R on the chromosome (99+1=100 test set genes) (see Supplementary File 2 for the lists of training and test set genes). 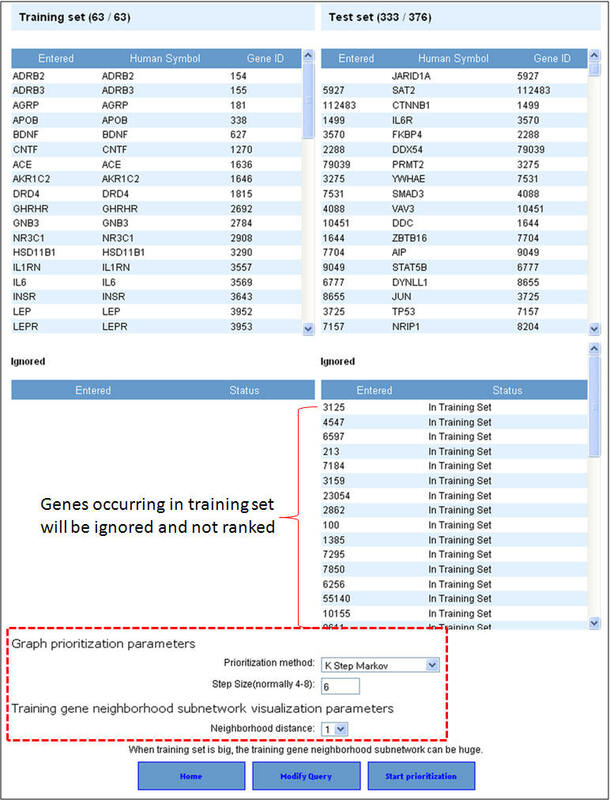 Both the training and test set genes are mapped onto the global PPIN and then the test set genes are scored based on how "close" they are to the training set genes. 1. From the homepage click on the third link ("ToppNet: relative importance of candidate genes in networks"). 2. 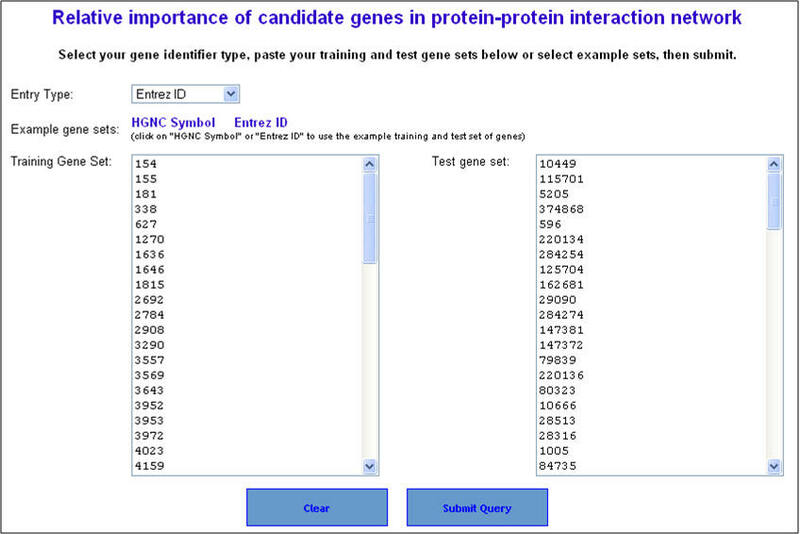 On the following page ("Relative importance of candidate genes in protein-protein interaction network"), enter either gene symbols or Entrez gene IDs, and click "submit query". 3. Select the network prioritization parameters. There are 3 options available (i) K Step Markov (default); (ii) HITS with Priors; and (iii) Page Rank with Priors. 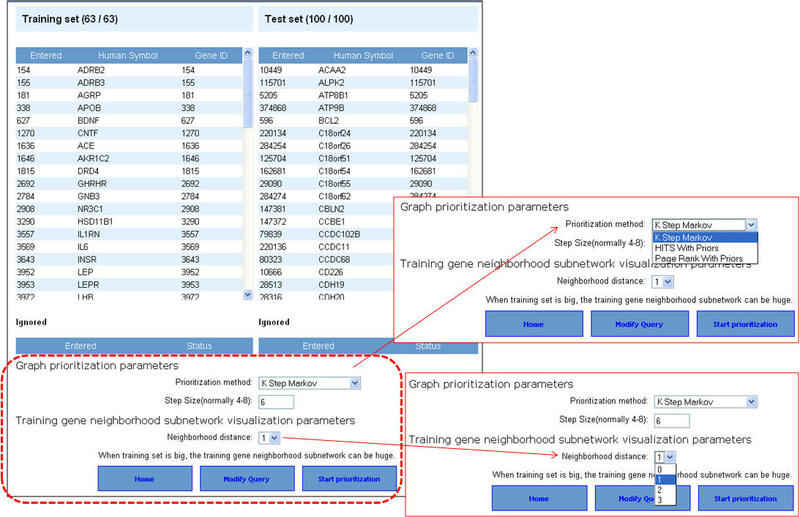 Also select the training gene neighborhood subnetwork visualization parameters (default is level 1) and then hit "Start prioritization" button. 4. Following the prioritization, the test set genes are ranked according to the score. The training gene subnetwork can be exported as a Cytoscape-compatible file. Additionally, the graphical representations of the training gene subnetwork are also presented. Query: To rank or prioritize a list of genes in the interactome of training set genes using either functional similarity (ToppGene) or PPIN analysis (ToppNet). We will continue using the same list of known obesity associated genes compiled from NCBI's OMIM and Entrez Gene as the training set. The test set this time will be composed of genes that are interacting with the training set of genes (level 1 = immediate interactants). 1. 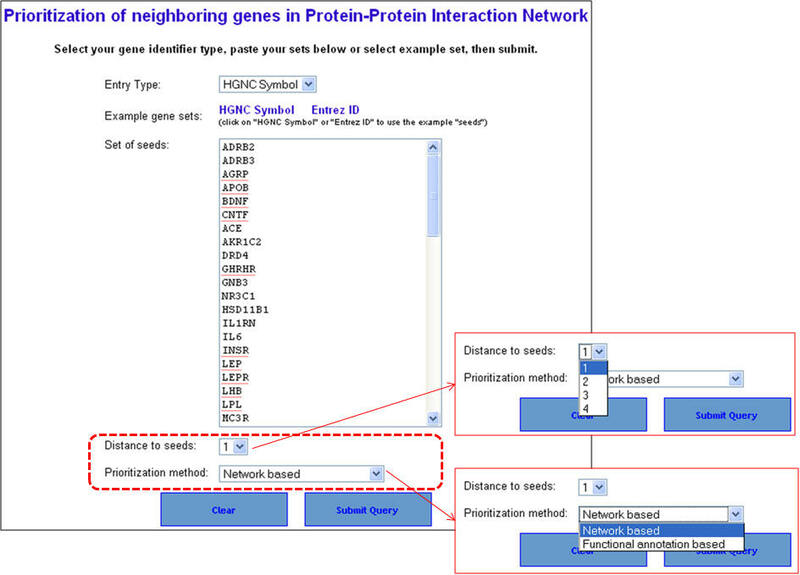 From the homepage click on the fourth option ("ToppGenet: prioritization of neighboring genes in protein-protein interaction network"). 2. 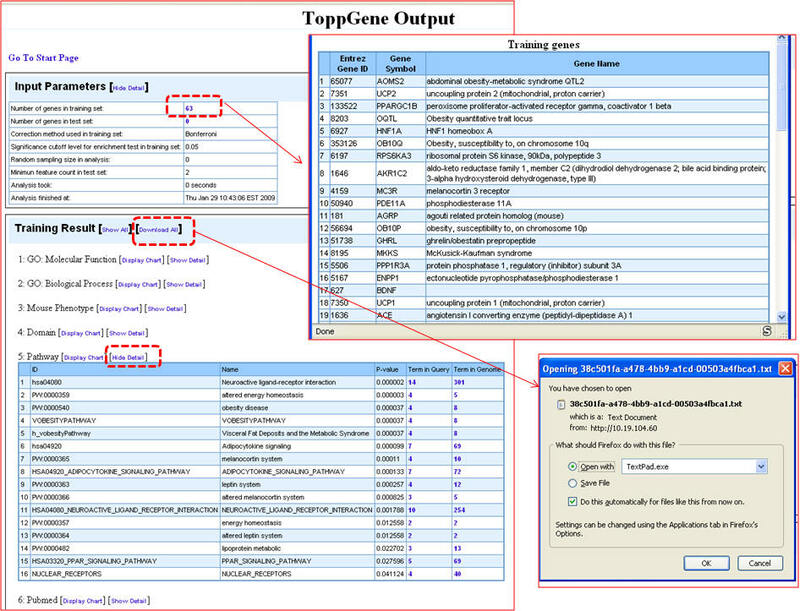 Enter the gene symbols and select the options as to how much interactome space you want to be considered, and whether you want to prioritization of the interactome genes to be done by functional similarity (ToppGene) or network analysis (ToppNet). When you select "distance to seeds" as 1, it means that the test set comprises all genes that are immediate interactants of the training set genes. Any overlapping or common genes between the training and test sets will be ignored from the test set and not considered for ranking. 3. 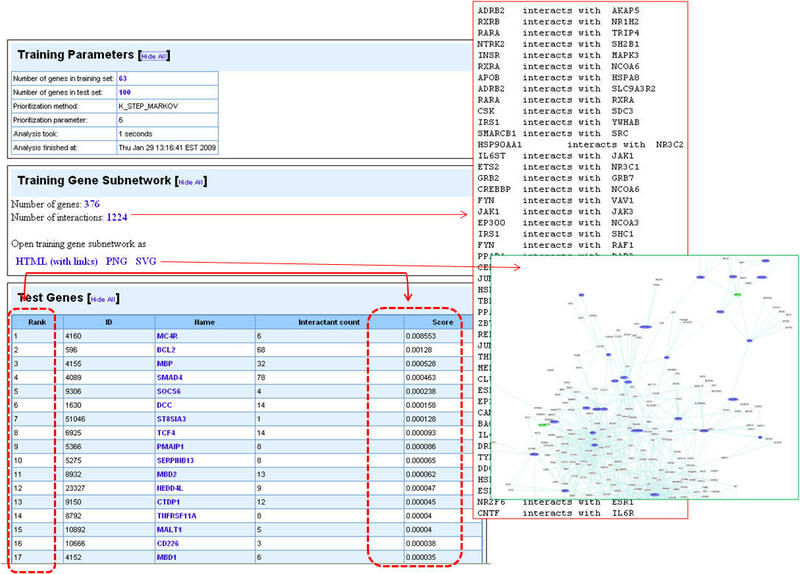 In this example extending the interactome to "level 1" fetches 376 genes which are used as test set after removing the common genes (i.e. those present in the training set too). The final test therefore comprises 33 genes (376-43). 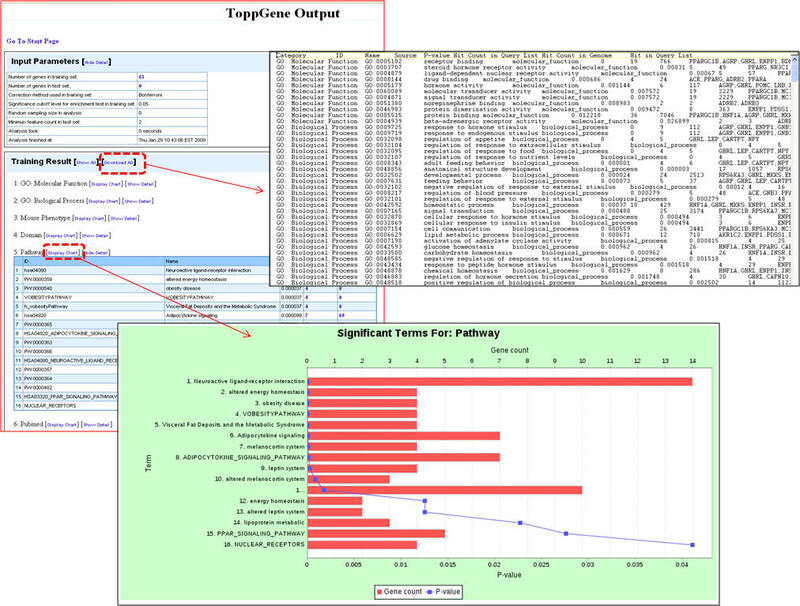 The first panel shows the prioritization done through PPIN analysis (ToppNet) while the lower panel shows the prioritization done based on functional similarity (ToppGene). 4. 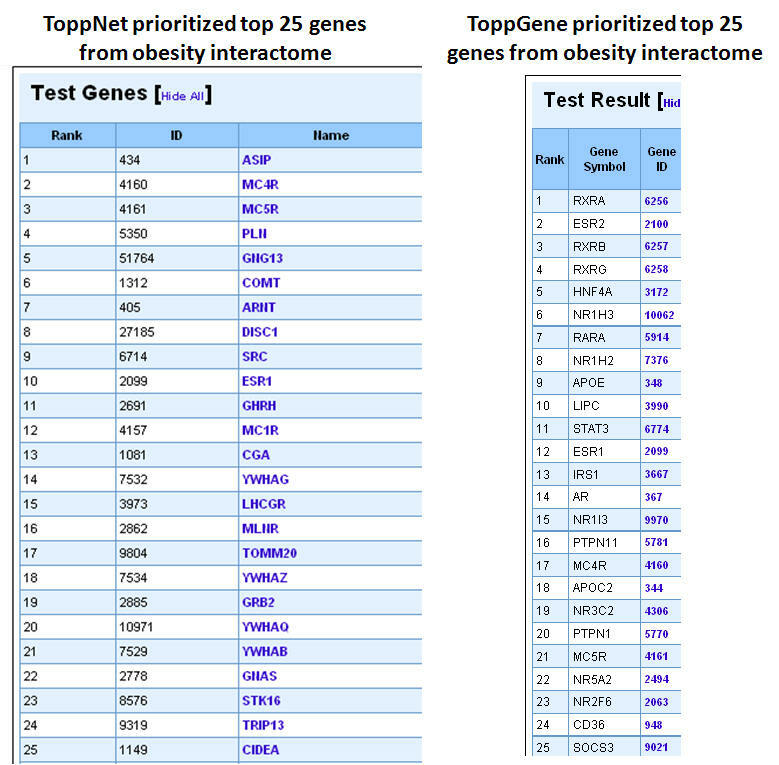 Below is a list of top 25 genes prioritized using ToppNet and ToppGene. 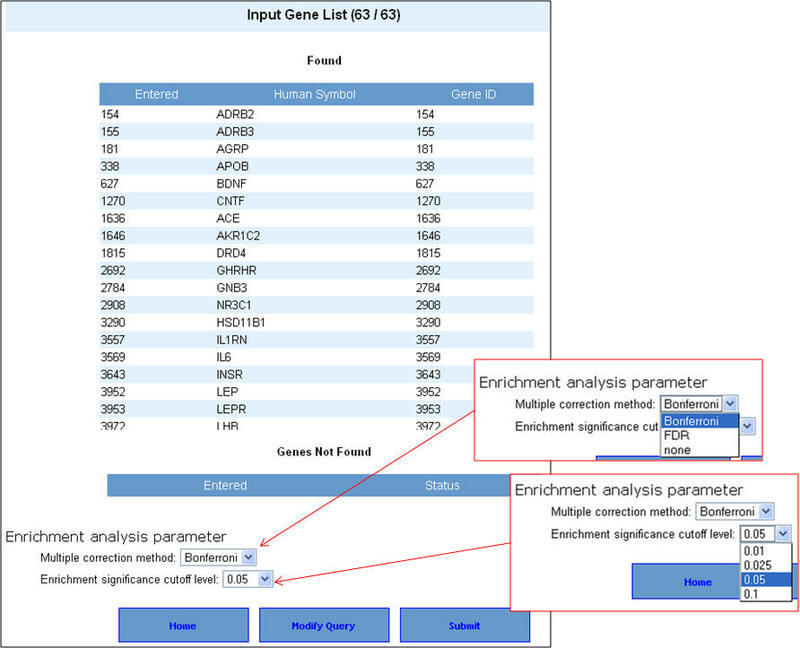 The training set of known disease genes were compiled from NCBI's OMIM and Entrez Gene records limiting the search option fields to "Disease/Phenotype" in the latter. The test set genes, as described earlier, were compiled by mixing the GWAS identified/confirmed candidate gene with 99 nearest neighboring genes in the genome (i.e. genes occurring in the flanking regions of the candidate gene). i. Results of the 20 candidate gene prioritizations for the below listed five genetic diseases using ToppGene and ToppNet. The gene-disease associations were from recently reported GWAS and include novel disease gene associations. 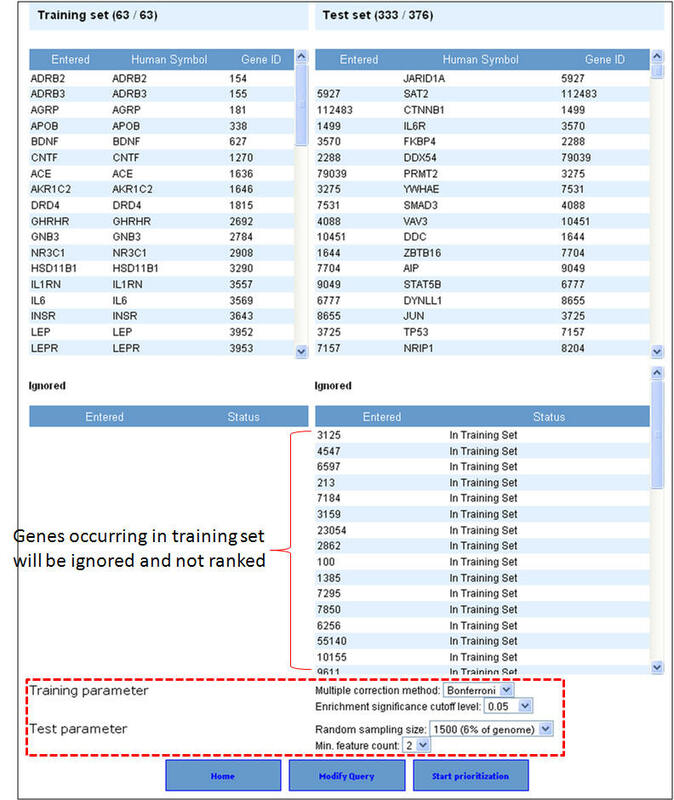 The training sets were compiled using “phenotype/disease” annotations in NCBI’s Entrez Gene records and OMIM. To build the test set genes, we defined the artificial linkage interval to be the set of genes containing the 99 nearest neighboring genes to the novel disease gene based on their genomic distance on the same chromosome. ToppGene and ToppNet prioritization results are presented in below. 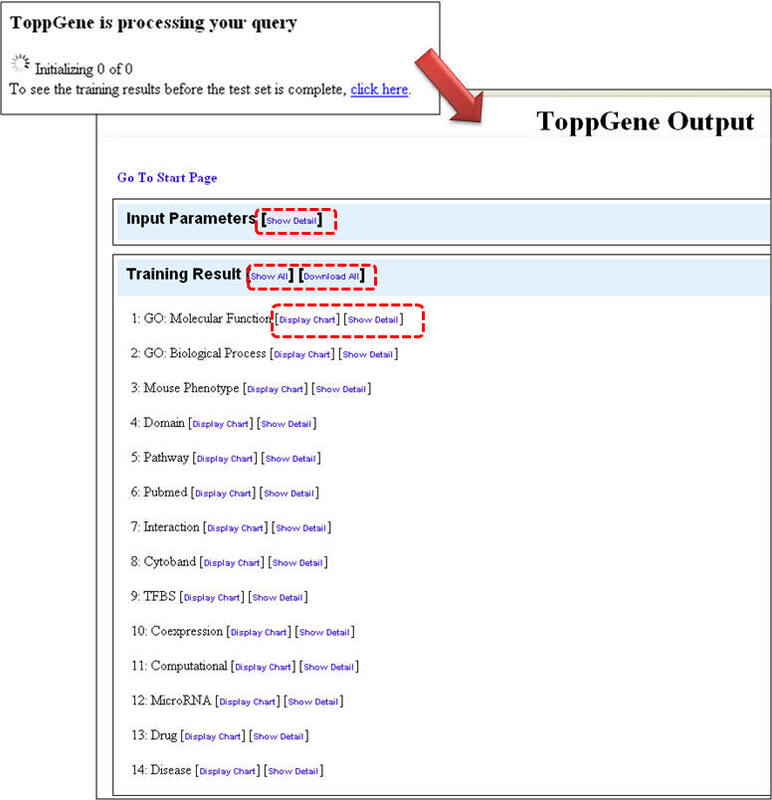 ToppGene ranked 19/20 (95%) candidate genes within the top 20% while ToppNet ranked 12/16 (75%) candidate genes among the top 20%. The mean ranks for ToppGene and ToppNet based prioritization were 6.8 and 11.75 (excluding 4 disease genes that lacked interaction data) respectively. Celiac disease Test Set genes for the following six candidate genes is compiled in a similar way as described for others previously. Crohn's disease Test Set genes for the following seven candidate genes is compiled in a similar way as described for others previously. 1. Le-Niculescu, H., Patel, S.D., Bhat, M., Kuczenski, R., Faraone, S.V., Tsuang, M.T., McMahon, F.J., Schork, N.J., Nurnberger, J.I., Jr. and Niculescu, A.B., 3rd. (2008) Convergent functional genomics of genome-wide association data for bipolar disorder: Comprehensive identification of candidate genes, pathways and mechanisms. Am J Med Genet B Neuropsychiatr Genet. 2. Dhandapany, P.S., Sadayappan, S., Xue, Y., Powell, G.T., Rani, D.S., Nallari, P., Rai, T.S., Khullar, M., Soares, P., Bahl, A. et al. (2009) A common MYBPC3 (cardiac myosin binding protein C) variant associated with cardiomyopathies in South Asia. Nature genetics. 3. Hunt, K.A., Zhernakova, A., Turner, G., Heap, G.A., Franke, L., Bruinenberg, M., Romanos, J., Dinesen, L.C., Ryan, A.W., Panesar, D. et al. (2008) Newly identified genetic risk variants for celiac disease related to the immune response. Nature genetics, 40, 395-402. 4. Fisher, S.A., Tremelling, M., Anderson, C.A., Gwilliam, R., Bumpstead, S., Prescott, N.J., Nimmo, E.R., Massey, D., Berzuini, C., Johnson, C. et al. (2008) Genetic determinants of ulcerative colitis include the ECM1 locus and five loci implicated in Crohn's disease. Nature genetics, 40, 710-712. 5. Villani, A.C., Lemire, M., Fortin, G., Louis, E., Silverberg, M.S., Collette, C., Baba, N., Libioulle, C., Belaiche, J., Bitton, A. et al. (2009) Common variants in the NLRP3 region contribute to Crohn's disease susceptibility. Nature genetics, 41, 71-76. Barrett, J.C., Hansoul, S., Nicolae, D.L., Cho, J.H., Duerr, R.H., Rioux, J.D., Brant, S.R., Silverberg, M.S., Taylor, K.D., Barmada, M.M. et al. (2008) Genome-wide association defines more than 30 distinct susceptibility loci for Crohn's disease. Nature genetics, 40, 955-962. 6. Franke, A., Balschun, T., Karlsen, T.H., Hedderich, J., May, S., Lu, T., Schuldt, D., Nikolaus, S., Rosenstiel, P., Krawczak, M. et al. (2008) Replication of signals from recent studies of Crohn's disease identifies previously unknown disease loci for ulcerative colitis. Nature genetics, 40, 713-715. 7. Renstrom, F., Payne, F., Nordstrom, A., Brito, E.C., Rolandsson, O., Hallmans, G., Barroso, I., Nordstrom, P. and Franks, P.W. (2009) Replication and extension of genome-wide association study results for obesity in 4,923 adults from Northern Sweden. Hum Mol Genet.